High oil prices, competing demands between foods and other biofuel sources, and the world food crisis, have ignited interest in algaculture (farming of algae) for making vegetable oil, biodiesel, bioethanol, biogasoline, biomethanol, biobutanol and other biofuels. Algae can be efficiently grown on land that is not suitable for agriculture and hold huge potential to provide a non-food, high-yield source of biodiesel, ethanol and hydrogen fuels. Several recent studies have pointed out that biofuel from microalgae has the potential to become a renewable, cost-effective alternative for fossil fuel with reduced impact on the environment and the world supply of staple foods, such as wheat, maize and sugar. Algae are unicellular microorganisms, capable of photosynthesis. They are one of the world’s oldest forms of life, and it is strongly believed that fossil oil was largely formed by ancient microalgae. Microalgae (or microscopic algae) are considered as a potential oleo-feedstock, as they produce lipids through photosynthesis, i.e. using only carbon , water, sunlight, phosphates, nitrates and other (oligo) elements that can be found in residual waters. Oils produced by diverse algae strains range in composition. For the most part are like vegetable oils, though some are chemically similar to the hydrocarbons in petroleum. Apart from lipids, algae also produce proteins, isoprenoids and polysaccharides. Some strains of algae ferment sugars to produce alcohols, under the right growing conditions. Their biomass can be processed to different sorts of chemicals and polymers (Polysaccharides, enzymes, pigments and minerals), biofuels (e.g. biodiesel, alkanes and alcohols), food and animal feed (PUFA, vitamins, etc.) as well as bioactive compounds (antibiotics, antioxidant and metabolites) through down-processing technology such as transesterification, pyrolysis and continuous catalysis using microspheres. Algae can be grown on non-arable land (including deserts), most of them do not require fresh water, and their nutritional value is high. Extensive R&D is underway on algae as raw material worldwide, especially in North America and Europe with a high number of start-up companies developing different options. Most scientific literature suggests an oil production potential of around 25-50 ton per hectare per year for relevant algae species. Microalgae contain, amongst other biochemical, neutral lipids (tri-, di-, monoglycerides free fatty acids), polar lipids (glycolipids, phospholipids), wax esters, sterols and pigments. The total lipid content in microalgae varies from 1 to 90 % of dry weight, depending on species, strain and growth conditions. In order to develop a more sustainable and economically feasible process, all biomass components (e.g. proteins, lipids, carbohydrates) should be used and therefore biorefining of microalgae is very important for the selective separation and use of the functional biomass components. The term biorefinery was coined to describe the production of a wide range of chemicals and bio-fuels from biomass by the integration of bio-processing and appropriate low environmental impact chemical technologies in a cost-effective and environmentally sustainable. If biorefining of microalgae is applied, lipids should be fractionated into lipids for biodiesel, lipids as a feedstock for the chemical industry and essential fatty acids, proteins and carbohydrates for food, feed and bulk chemicals, and the oxygen produced can be recovered as well. Large product basket with energy-derived (biodiesel, methane, ethanol and hydrogen) and non-energy derived (nutraceutical, fertilizers, animal feed and other bulk chemicals) products. Better growth yield and lipid content than crops. Indeed, after oil extraction the resulting algal biomass can be processed into ethanol, methane, livestock feed, used as organic fertilizer due to its high N:P ratio, or simply burned for energy cogeneration (electricity and heat). 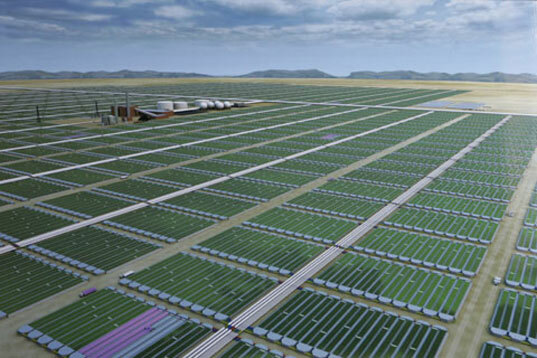 If, in addition, production of algae is done on residual nutrient feedstock and CO2, and production of microalgae is done on large scale in order to lower production costs, production of bulk chemicals and fuels from microalgae will become economically, environmentally and ethically extremely attractive. Tagged Algaculture, Algae, Algae Biorefinery, algae cultivation, algae farming, Biomass, Bioproducts, Bioreactor, biorefinery, wastewater, what is algae biorefinery. Bookmark the permalink. The ongoing support from the private investment community speaks to how strongly they believe in the development of Green Crude as an alternative fuel resource, especially ability to commercialize it. An important issue is the development of a greenhouse to cover indestructible or algae growing surface covering completely eliminating the costs and making a hermetic environment without isolating mosquitoes and water harmful temperatures. With this system eliminate the pools traditional building surfaces can be covered over 100 hectares unifying the water body as a whole. I have and I have patented laboratory example to demonstrate. Photos. The CO2 can be taken from the air and no technology for it, if you informed of your interest. The continuous communication that we have and the results we get I’m willing to cooperate and that is economically sensible to me.